In the winter of 1950 General Douglas MacArthur declared “The troops will be home by Christmas …” but unknown to the US Commander, the First Marine Division was being surrounded by over 120,000 Chinese troops. 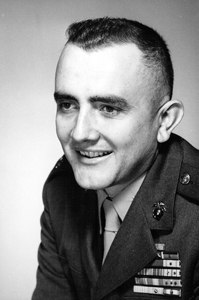 On November 29th at the Chosin Reservoir in North Korea Captain Carl Sitter received his fateful orders – take East Hill. Sitter was born in the steel town of Pueblo, Colorado and the town’s tough work ethic prepared him for his heroic deeds ahead. In frigid sixty below zero conditions Sitter and his men headed up East Hill. For three long nights, out numbered twenty to one Sitter’s troops battled the ferocious Chinese troops – often in hand to hand combat. Sitter recalls feeling as though he was protected by an invisible shield. He gallantly executed his orders and today his feat is legendary in the annals of Marine Corps history. Sitter strategically maneuvered his men to take and hold East Hill. Despite being wounded several times he refused evacuation and heroically led his men out of the Chosin Reservoir trap. Sitter carried through on his promise that no one would be left behind. Now retired Marine Lt. General Stephen Olmstead calls himself one of “Carl’s boys” and refers to his association with Sitter as the “highlight of my life”. Sitter retired as a highly respected Marine Colonel. Only one month prior to his death at the age of seventy-seven, Sitter was to graduate from a seminary university and planned to minister to the home bound and elderly. Sitter is buried at Arlington National Cemetery. Click below to view excerpts from the Carl Sitter segment.